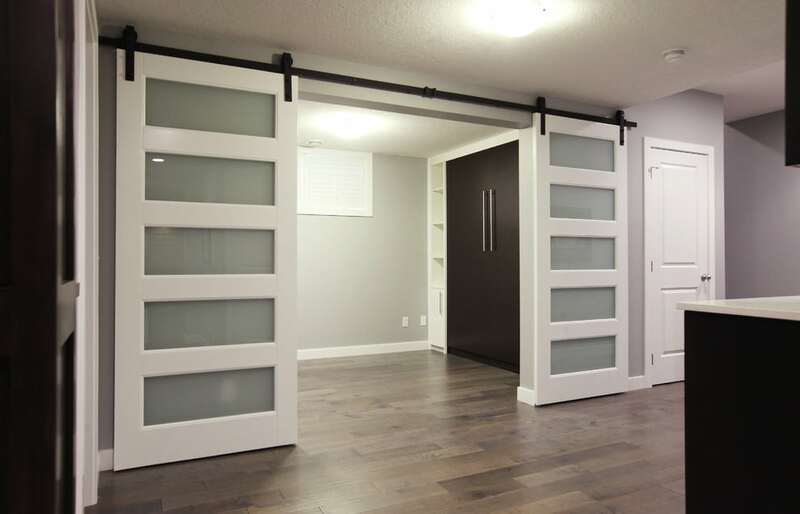 Basements don’t have to be downright scary or look as if it’s a lunatic’s lair like in the movies. 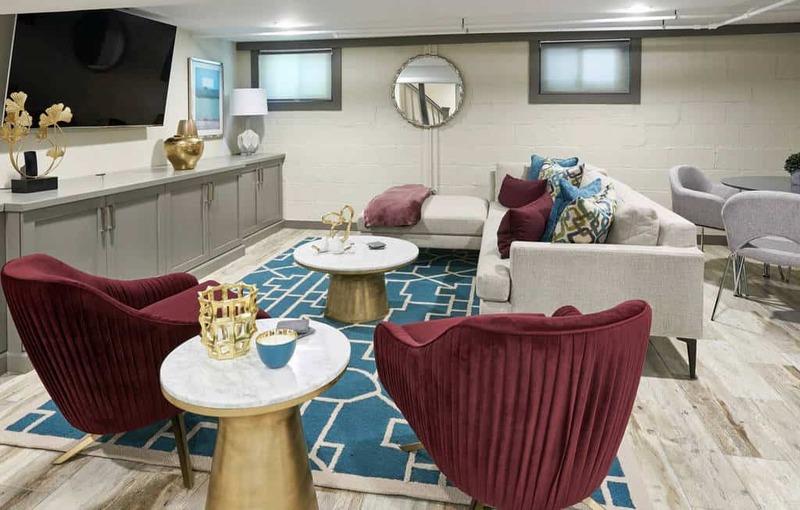 Take charge, be a little adventurous and turn your basement from a cold and stark storage place into a comfortable and cozy hangout area for the whole family. Just bring in surprising elements like a fireplace or a modular sofa, or even convert a dead corner into an open bar and you’re all set. This will surely make the space warm and be inviting, as well as pleasing to the eyes. 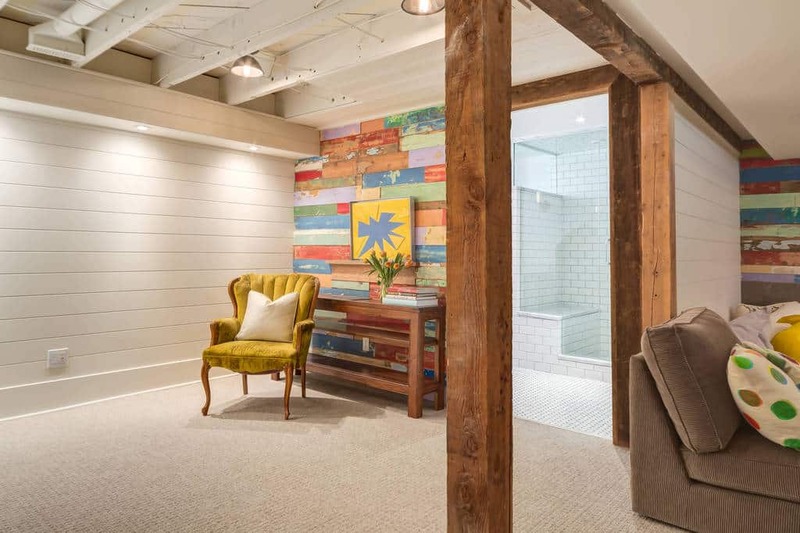 Once you nailed down the right ingredients for your perfect basement getaway, the next thing to do is sprinkle it up with items that will turn it into a place of rest and relaxation. Hanging the right piece of art or fashioning a gallery of inspiring memorabilia will help set the tone and mood of the place. Integrating elements from the outdoor such as plants also aid in creating an appealing oasis that echoes the calm and tranquil of nature. 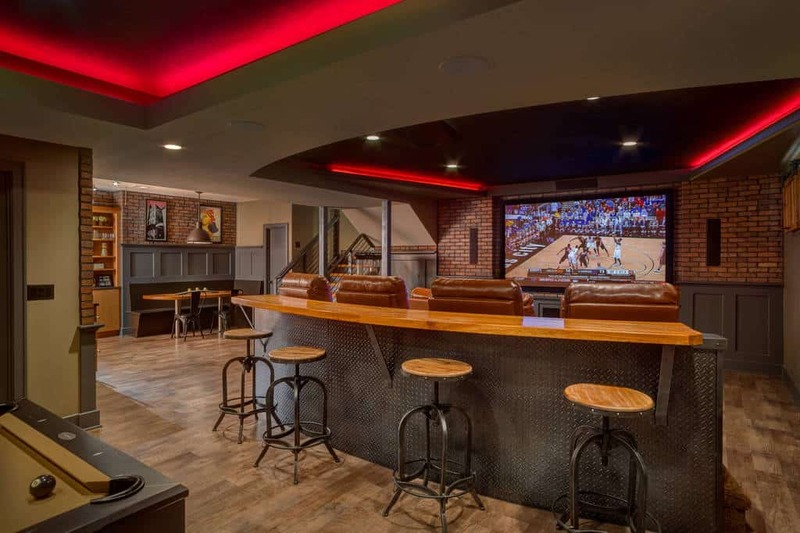 Check out some of these delightfully ravishing basement designs and carefully take note of some of the wonderful ideas that will inspire you to take the next step towards renovating your basement. 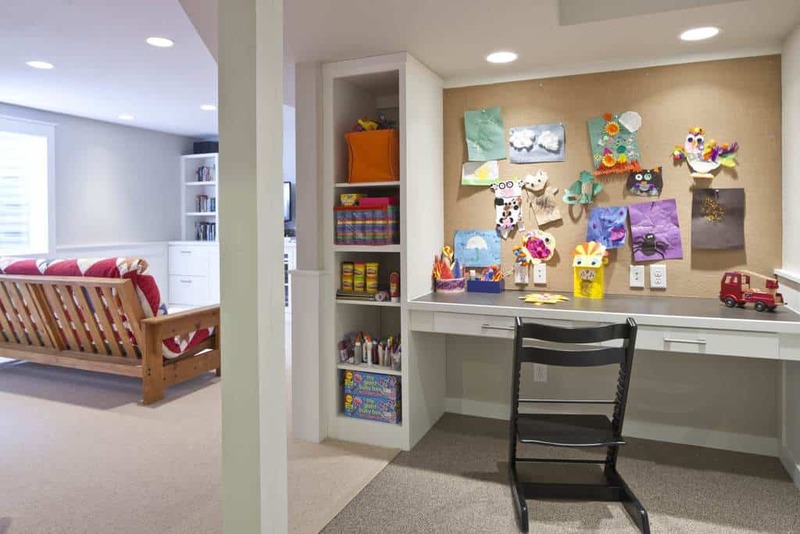 An art and crafts space features a cork board to display colorful paper crafts. A built-in shelving and desk offer a working space beside a nearby wooden sofa. 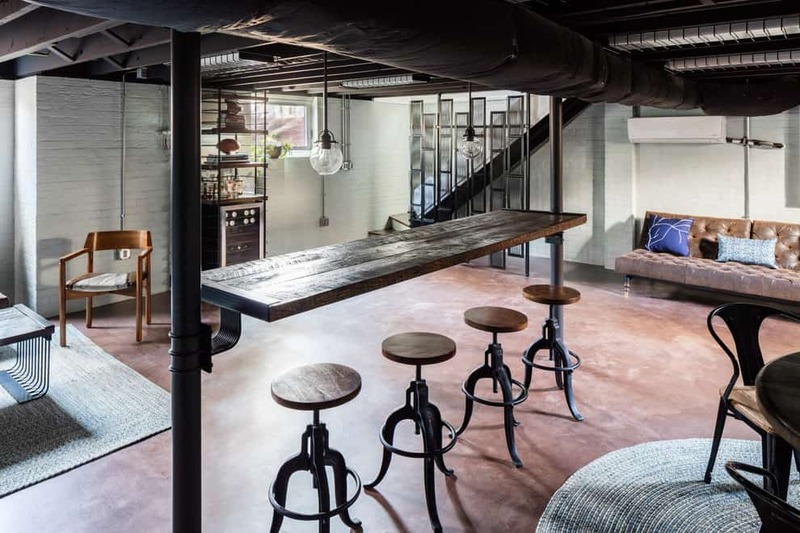 Industrial themed basement interior offers a bar area for some casual conversation. The ceiling is accentuated with red cove ceiling for a modern feel. 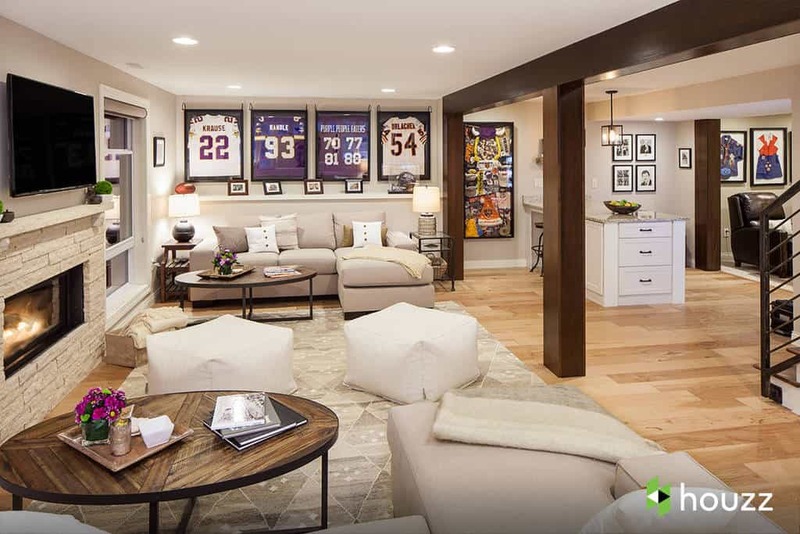 Photo by Catherine Renae Thomas Design Co.
Collectible jerseys framed and put on display in the interior of a lovely home accentuated by wood posts and trusses. Sliding glass door in white framing opens the door of this walk-in closet. A dark shade of wood makes a contrasting element to the white wall while the hardwood floor provides warmth. The blend of white and wood finishes harmonize the floating bar area creating a modern rustic atmosphere. 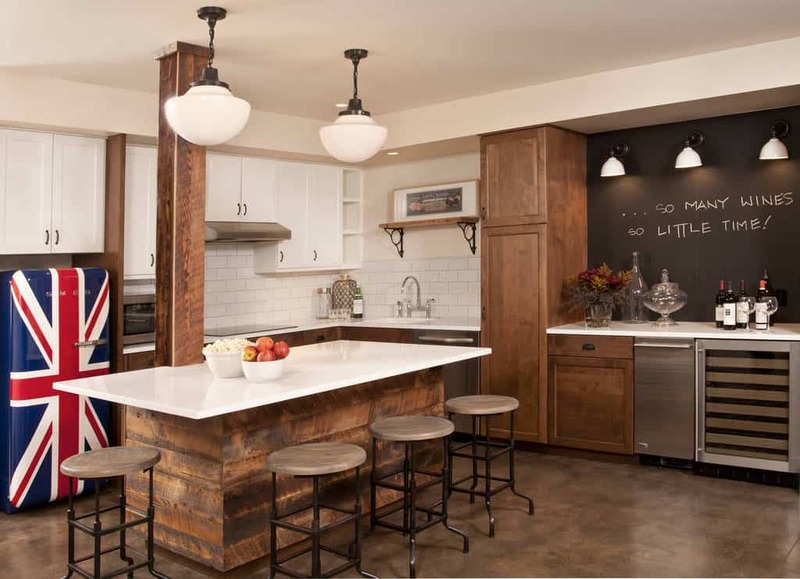 The subway tiles compliments the vintage pendant lights for a design continuity. 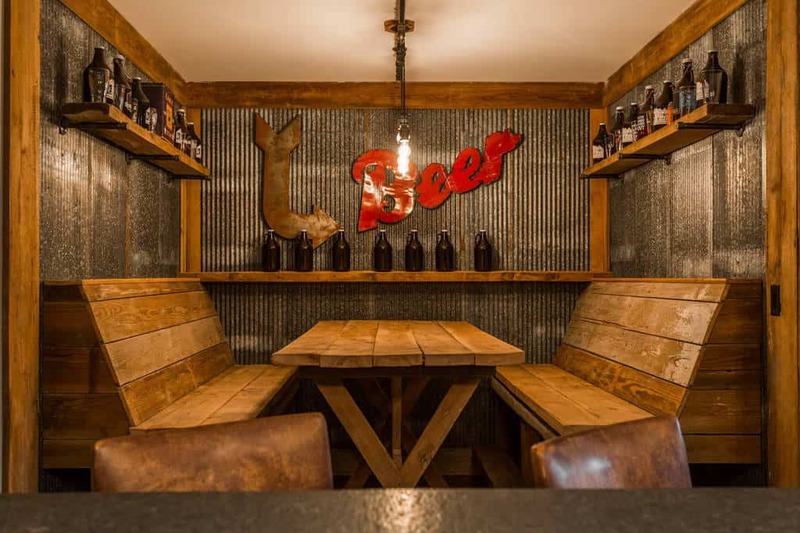 This dramatic booth area covered in reclaimed wood makes an interplay of texture with the galvanized sheets. The hanging light fixture brightens up the intimate space. 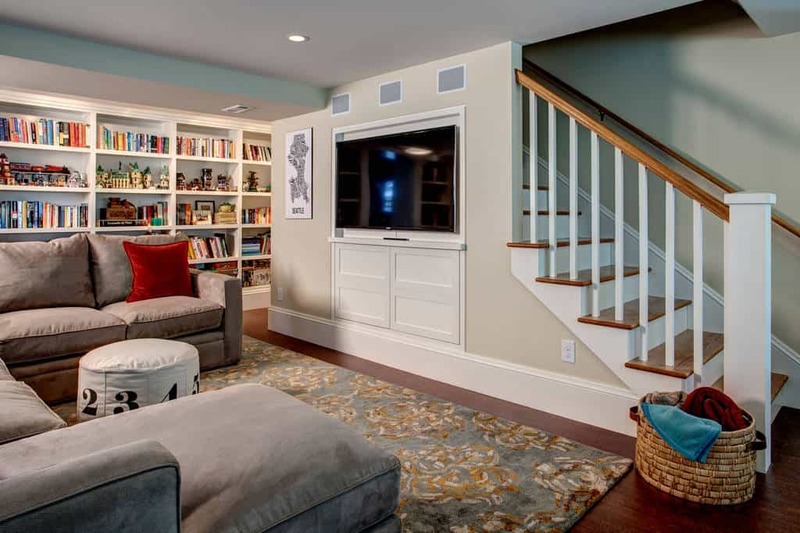 Contrasting color of the white ceiling and hardwood flooring creates a harmonious appeal in this entertainment area. 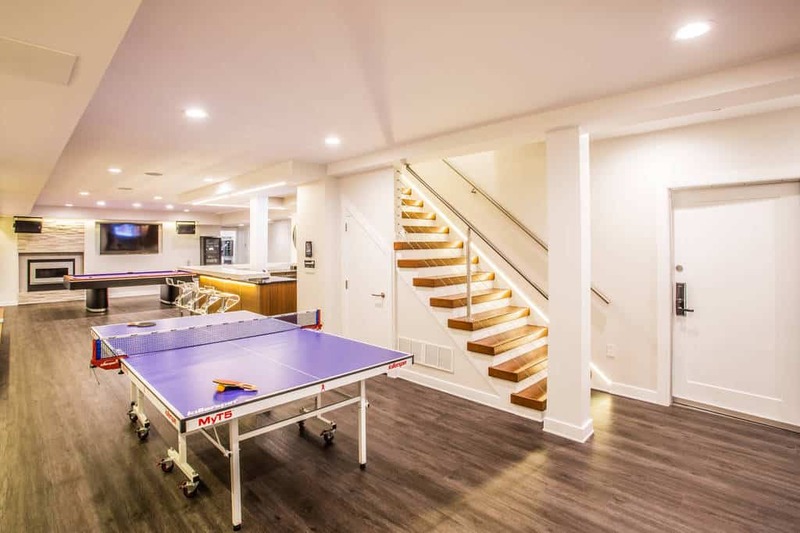 The elegant staircase leads down to the purple ping pong table. 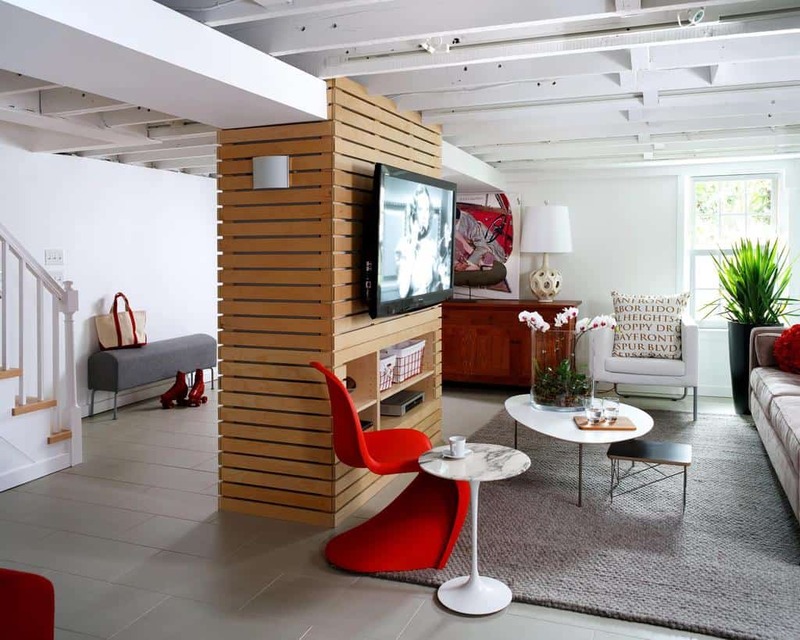 Red accents transformed an all-neutral interior into a sizzling hot place to be. The Phantom chair raised the style factor sitting comfortably beside the slatted wood media center. A stylish upholstered chair with cabriole legs provides an emphasis on color in front of a colorful reclaimed wood and white paneled walls. 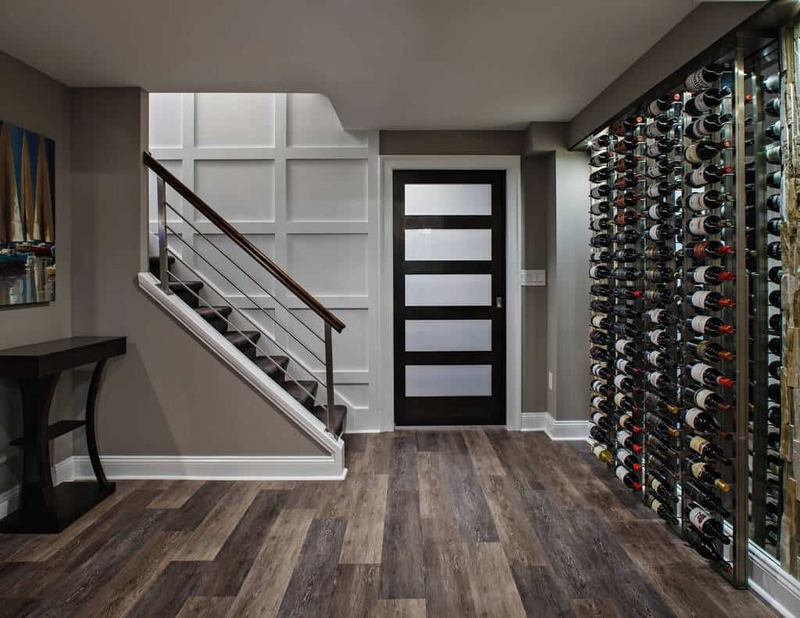 Photo by Creative Design Construction, Inc.
Paneled white wall leads to a contemporary wine cellar filled with an array of vino. 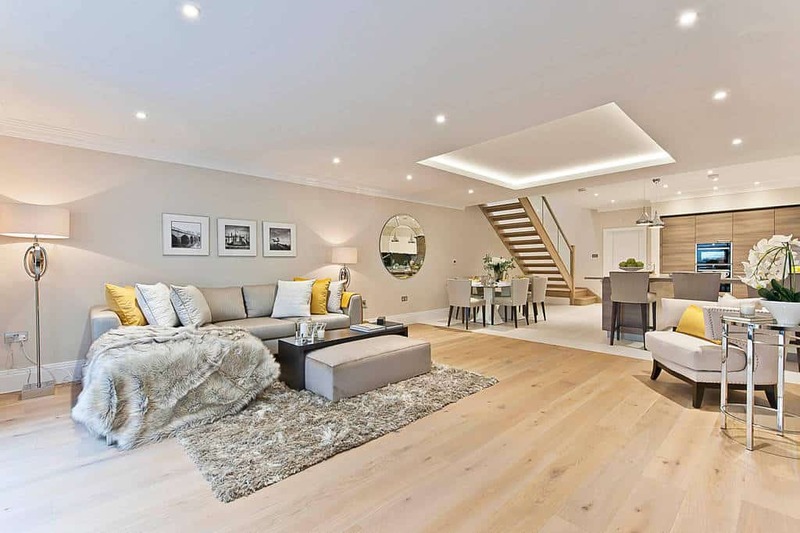 The modern railing and hardwood floors mark an upbeat interior. A well-lit apartment plays on different textures and finishes. The shag rug and fleece shawl contrast the crisp leather sectional sofa and warm hardwood flooring. 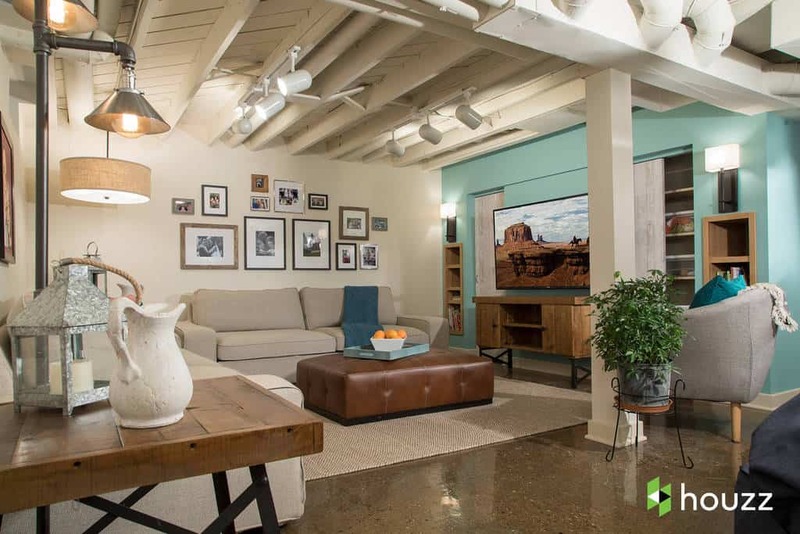 Teal colored wall accentuates this interior while presenting a relaxed ambiance. A gallery of artworks harmoniously placed behind the sofa to create interest. Sophisticated seating area requires a sophisticated color combination, such as deep red and sea green as seen in the color of the armchair and geometric sofa of this interior. 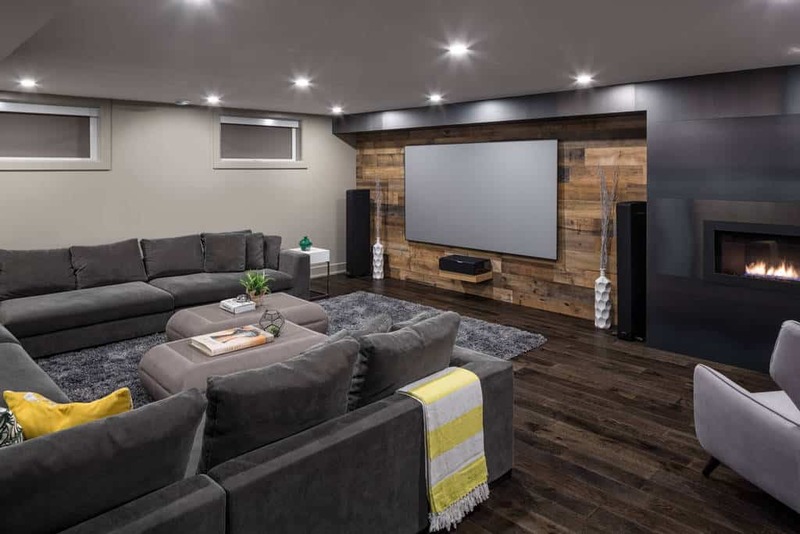 Different tones of gray created a masculine feel for the interior, underscored by the hardwood flooring and reclined wooden accent wall behind a screen projector. 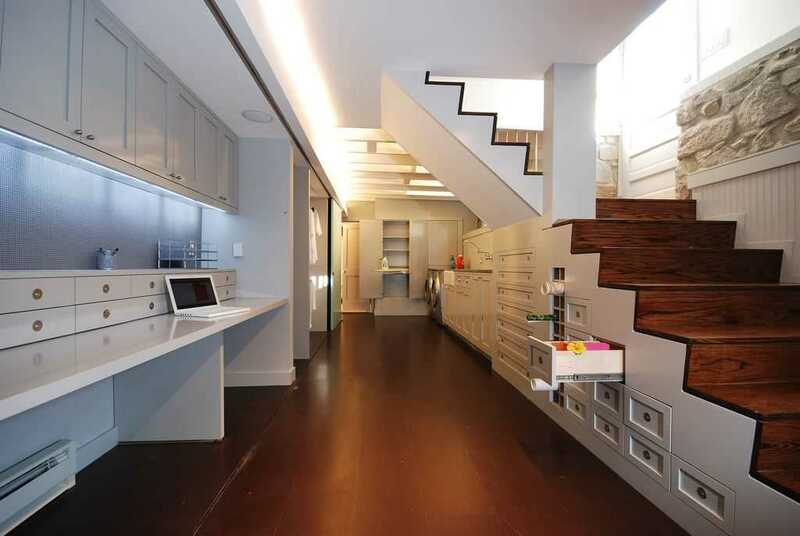 The staircase filled with lots of drawers makes the most out of the otherwise dead space. The delicious contrast between white and mahogany stained wood makes the room look clean and feel warm. 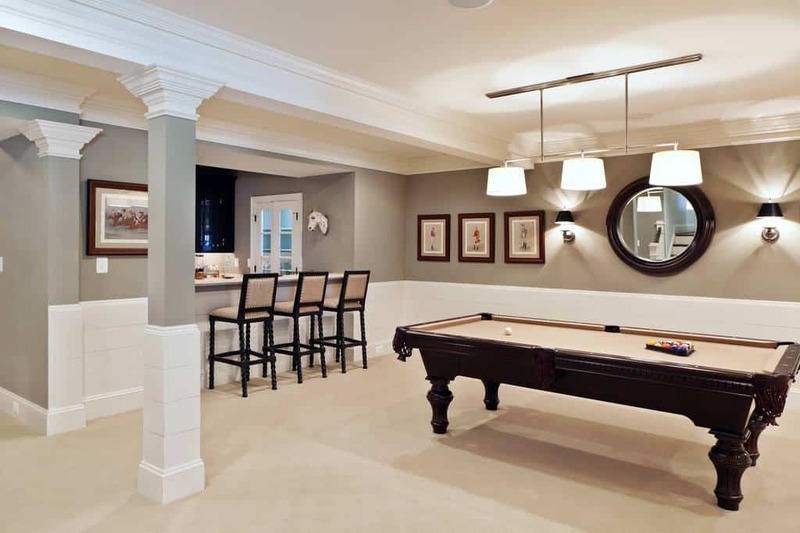 Grey colored walls envelopes the interior of this game room that features billiard table, beige carpet, and a bar area. 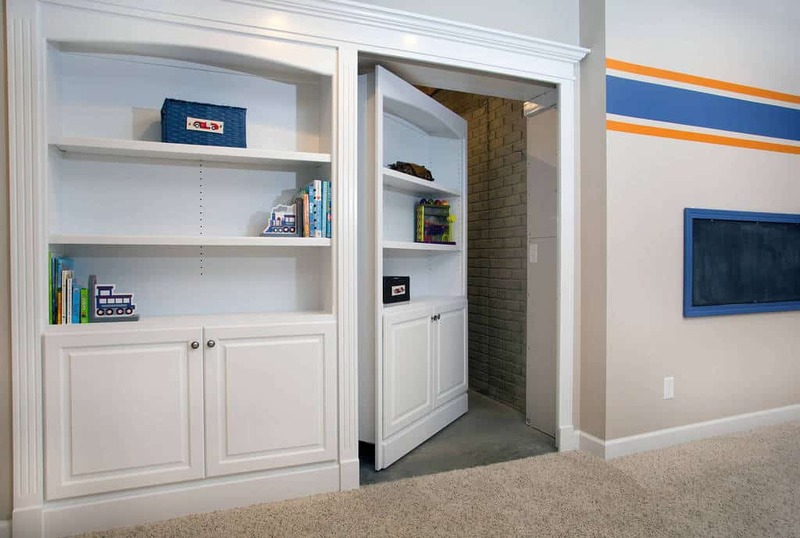 A secret door to a hidden storage is cleverly disguised as a bookshelf. 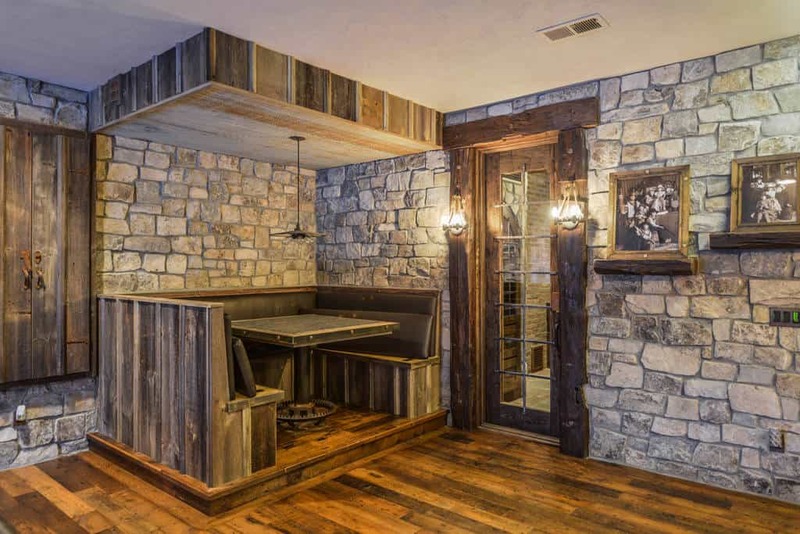 Stone finishes escalate the rustic appeal of his interior. Reclaimed woods used in the booth seating and door framing forms a variety with the hardwood flooring. 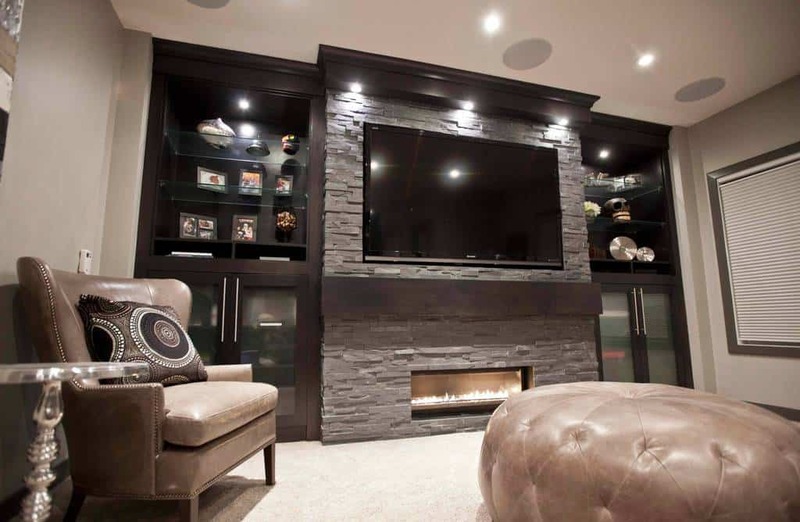 Round shapes accentuated the industrial vibe coming from this room. 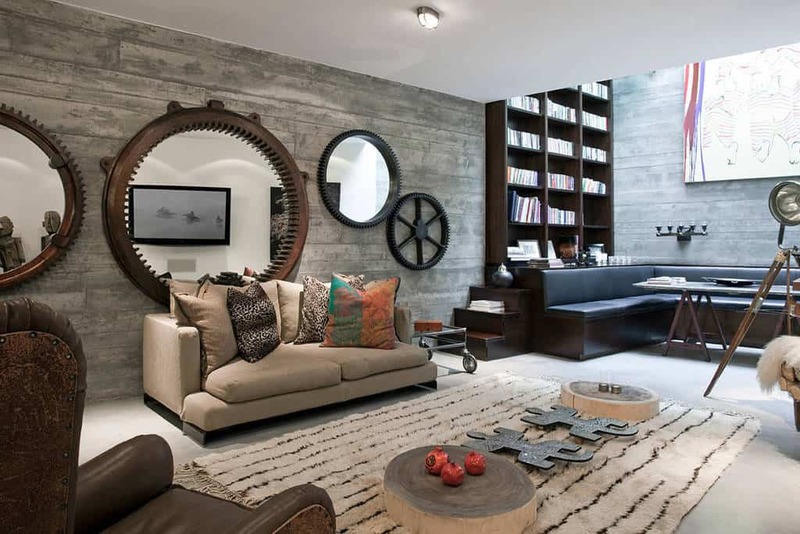 Simulated wood in cement finish at the back wall plays nicely with the polished wood finished of the sofa and tall bookshelves. 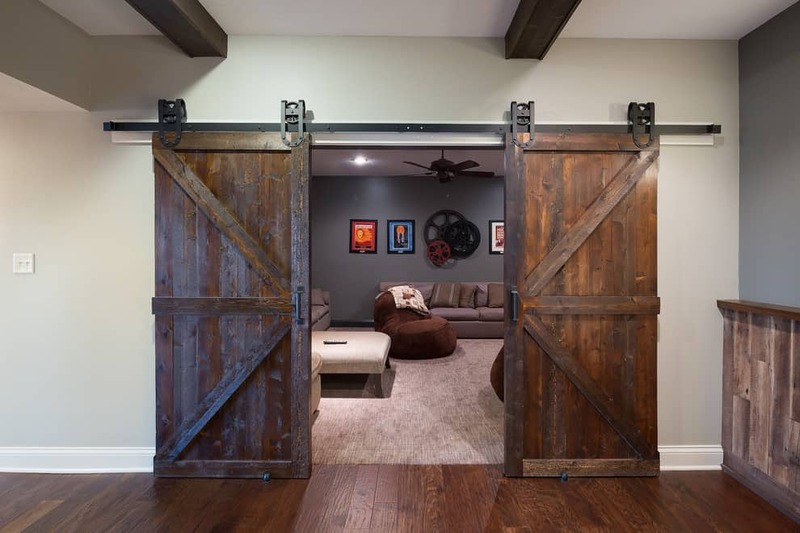 A barn-type door slides up to reveal the seating area on the other side. 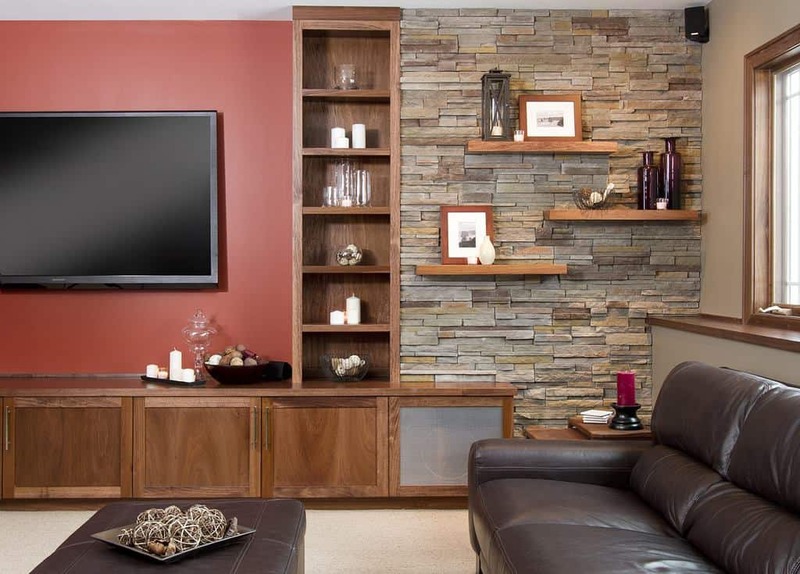 The rustic quality of the wood creates makes a sharp contrast against the plain wall. 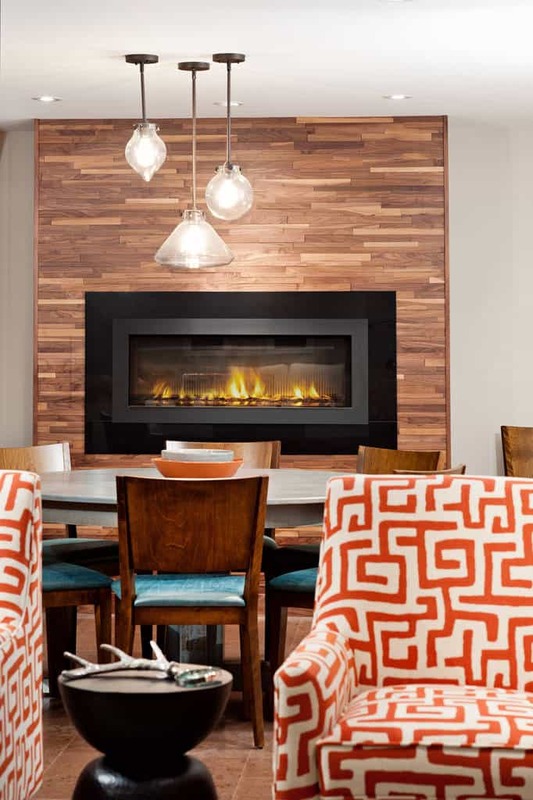 Photo by Pizzale Design Inc.
A set of armchairs with orange patterns energizes a room that features a modern fireplace that exudes confidence and tranquility. Stained wood built-in divides the tomato red wall and rough textured brick wall. The nearby leather sofa and ottoman casually enjoy the drama. A wingback armchair with a matching tufted round sofa are both dressed in tan leather and sharpens the modern vibe of the dark flat screen TV of this apartment. 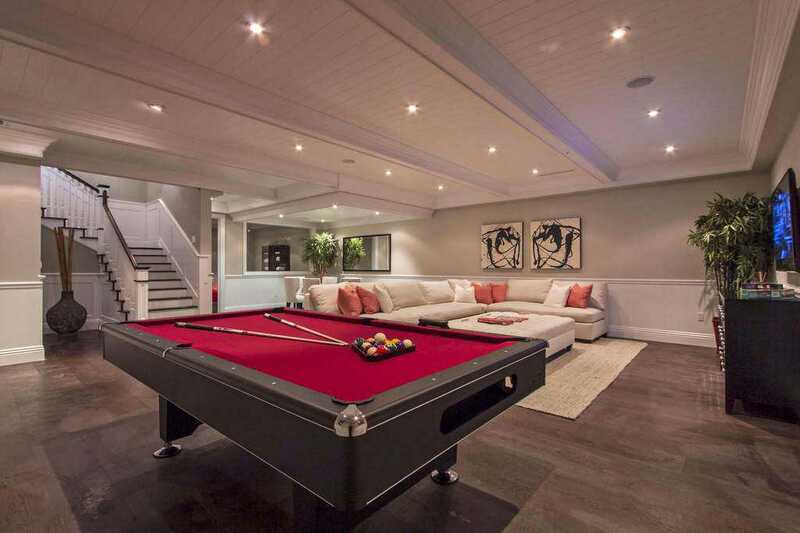 Plank ceiling in white paint spans from end to end of this game room accentuated by the red turf of the billiard table and red pillow covers in the white sectional sofa. The wide array of books displayed in the bookshelves provides an alternative past time aside from the TV in this contemporary sanctuary. Adjustable industrial barstools level up with the height of the wooden top shelving that doubles up as a bar. 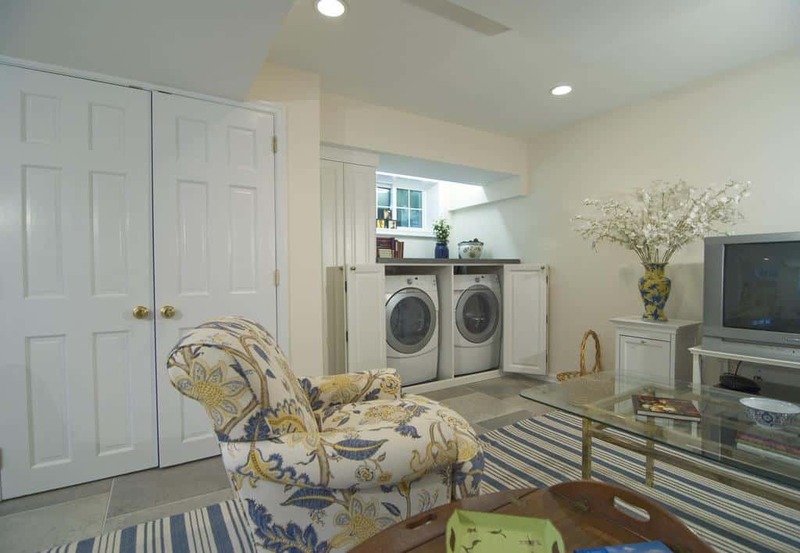 A comfortable armchair provides a relaxing spot while doing the laundry in a nearby washing machine neatly tucked in the corner of the room.